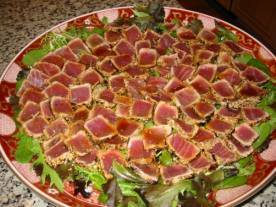 Cut tuna into 1 ½ to 2 inch bars and place in a shallow glass dish. Combine 2 teaspoons mirin, 2 teaspoons soy sauce, 1 teaspoon sugar, 1 teaspoon lemon juice and ¼ teaspoon ginger. Pour mixture over tuna and turn to coat. Cover and marinate 30 minutes. Combine remaining ¼ cup mirin, ¼ cup soy sauce, 2 tablespoons sugar, 2 tablespoons lemon juice, 1 teaspoon grated ginger and wasabi. Set aside until ready to serve. Grill on a hot, well-seasoned grill pan or grill pan sprayed with nonstick olive oil cooking spray, turning to sear all sides. Tuna should be pink in center. Sprinkle with sesame seeds and slice in ¼ inch slices. Lay over baby greens on a serving plate. Spoon wasabi sauce over salad.